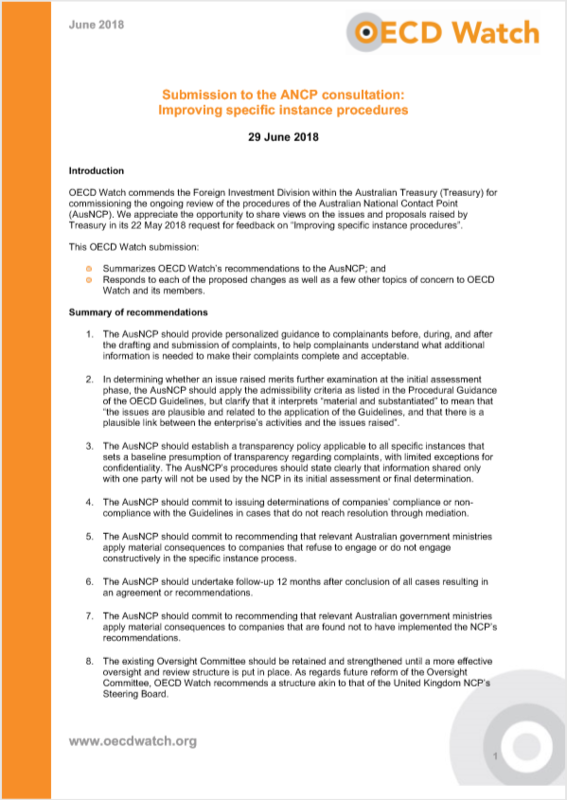 This statement highlights OECD Watch and MiningWatch Canada’s concerns with the Canadian NCP’s improper handling of the BMF vs Sakto Group specific instance. On May 16, 2018, MiningWatch Canada and OECD Watch issued a media release to draw attention to an attempt by the Government of Canada to cover up its mishandling of a complaint through Canada’s National Contact Point (NCP) for the OECD Guidelines for Multinational Enterprises. The Request for Review in question, titled “Complaint against the Sakto Group, Ottawa” was filed with Canada’s NCP in January 2016 by the not-for-profit Bruno Manser Fonds (BMF) of Switzerland. The complaint alleges that the Sakto Group, with corporations headquartered in Ottawa, breached disclosure requirements of the OECD Guidelines for Multinational Enterprises, a guide to responsible business conduct that is binding on Canada and other members of the OECD. It is not, and has never been, our intention to express an opinion on the issues BMF raised with the NCP in regard to the Sakto Group, but rather to shed light on the failure of the NCP to follow OECD procedural guidance on the handling of such cases, and its failure to be transparent regarding its reasons for deviating from established practice in this case. Following our release of May 16, 2018, MiningWatch Canada and OECD Watch received letters from legal counsel for Sakto Corp. complaining of the release. We are replacing our brief May 16, 2018, press release with this more detailed statement regarding the mishandling by the NCP of the case brought by the BMF. 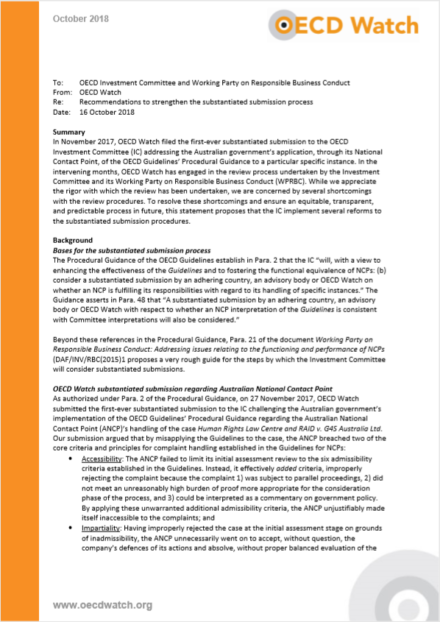 On May 11, 2018, the Canadian Department of Justice, on behalf of the Canadian NCP, sent letters to two not-for-profit organizations, the Bruno Manser Fonds (BMF) of Switzerland and Amsterdam-based OECD Watch, asking the organizations to remove a document concerning BMF’s complaint with the NCP from their websites. This heavy-handed action on the part of the Government of Canada followed two years in which Canada’s National Contact Point for the OECD Guidelines mishandled the complaint brought by BMF against the Sakto Group. The Canadian NCP is a governmental complaint mechanism set up to resolve allegations of corporate misconduct related to the OECD Guidelines. It has long been accused of lack of impartiality and ineffectiveness. The NCP’s irregular handling of BMF’s complaint is illustrative of these concerns. The Procedural Guidance by the Canadian NCP envisions 3 months between receipt of a complaint till issuance of the final Initial Assessment. As the case was filed in January 2016 the draft Initial Assessment provided in October 2016 was already six months past the proposed due date for a final Initial Assessment. Instead, five months later in March 2017, the NCP produced a draft final statement that dismissed the case without providing any clarification for its complete reversal in position. 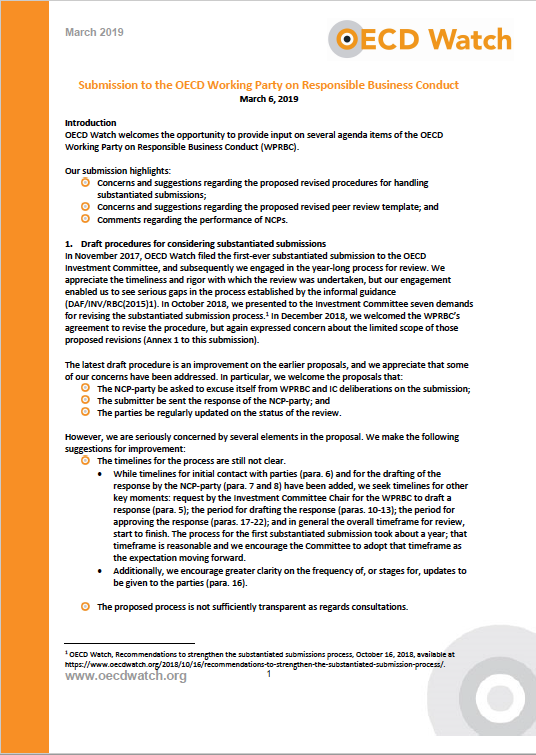 This draft final statement, just over one page in length, made no reference to the careful considerations evident in the NCP’s 11-page draft initial statement of October 2016, which concluded that BMF’s concerns warranted further discussion between the parties. Further, the draft initial assessment was not finalized and published by the NCP despite its commitment in the draft assessment to do so. The NCP’s reversal was finally somewhat explained when, in July 2017, it issued a new, eight-page final statement, this time revealing pressure it had faced from Sakto, including:“Sakto involving a Member of Parliament during the confidential NCP assessment process; (…) Sakto’s aggressive challenge of the NCP’s jurisdiction; (…) Sakto’s legal counsel making submissions to the Government of Canada’s Deputy Minister of Justice….” The NCP also accused BMF of “inappropriately sharing confidential information with Canadian and foreign NGOs about the ongoing NCP process” and of going to the media with the organization’s concerns regarding the NCP’s process. It has to be noted here that BMF only publicized its concerns after the NCP issued its draft final statement rejecting the case in March 2017. The NCP cannot, and does not, accuse BMF of sharing confidential information with NGOs, or going to the media, in the period between its filing of the complaint in January 2016 and its receipt of the draft final statement in March 2017, with its curt and unexplained reversal of the NCPs earlier draft initial assessment. This means the NCP had decided to reject the case before BMF shared any information with other NGOs or the media, and that the NCP did not decide to reject the case as a result of confidentiality concerns related to BMF. In our opinion, at the time BMF went public on the case, which the NCP’s draft final statement said it considered to be closed, BMF did so not as a “notifier,” but as a “whistleblower” on a flawed and harmful process undertaken by an office of the Government of Canada. In May 2018, almost a year after issuing its July 2017 final statement in the case, the Canadian NCP again changed course and contradicted itself, retracting its own final statement and replacing it with a new final statement. On May 11, 2018, the NCP, unilaterally, without consulting BMF, and unprecedentedly, retracted its detailed eight-page final statement of July 2017 and replaced it with yet another new one-page final statement that does not explain why the July 2017 final statement was being replaced. This dramatically shortened new final statement also removes all mention of concerns about Sakto’s conduct (as detailed in the July 2017 final statement), but still mentions that BMF shared its concerns about the process in April 2017 and accuses BMF of breaching confidentiality. 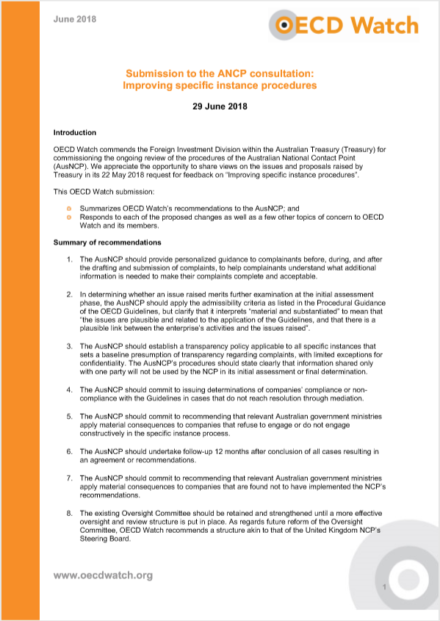 On May 11, 2018, the same day that the NCP issued its new final statement, the Department of Justice, on behalf of the NCP, sent cease and desist letters to the Bruno Manser Fonds and to OECD Watch asking the organizations to remove copies of the NCP’s October 2016 draft initial assessment of the case – the one in which the NCP found BMF’s allegations “material” and “substantiated” – from their websites. On May 29, 2018, MiningWatch Canada received a similar cease and desist letter from the NCP. OECD Watch and MiningWatch Canada are weighing in on this case almost a year after it was officially closed by the NCP in July 2017. 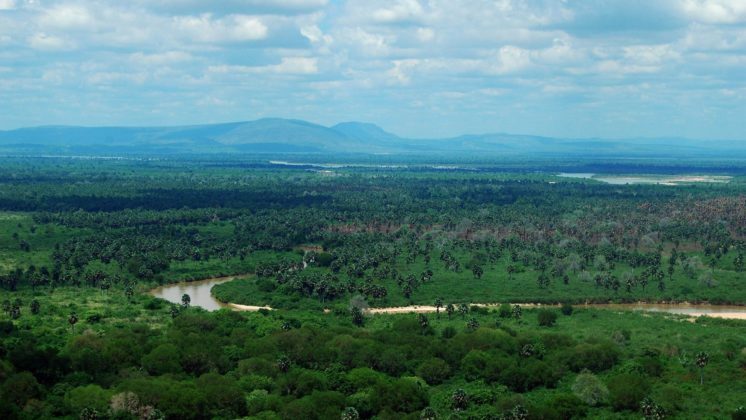 We are doing so as organizations with an abiding interest in the issue of corporate accountability and access to remedy for victims of environmental and human rights abuses by multi-nationals. In that regard, we have a long-standing engagement with Canada’s NCP, as notifiers, supporters of cases, and critical assessors of the NCP’s handling of cases. We are commenting on the BMF complaint in the latter capacity. 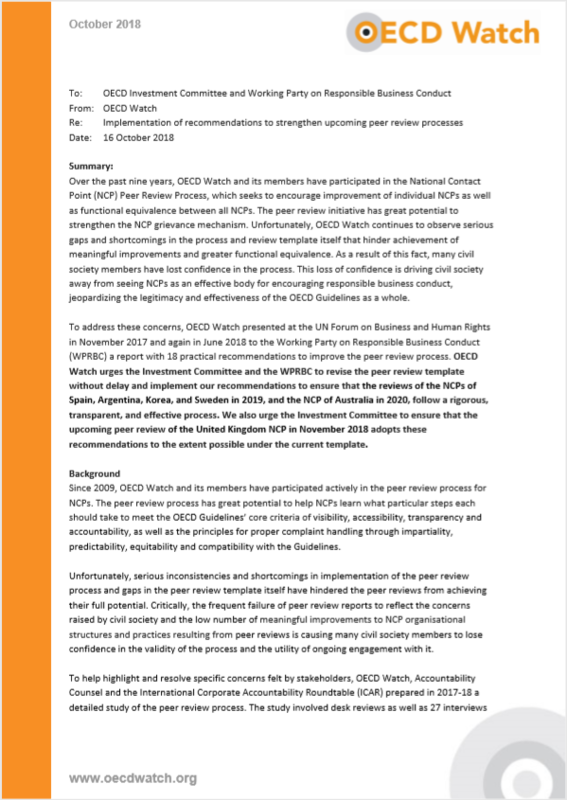 We have detailed the history of the NCP’s handling of the complaint brought by BMF against the Sakto Group to raise awareness of the fact that the Canadian NCP has flouted the procedural rules set by the OECD for handling complaints, and, as of May 11, 2018, is trying to hide its missteps by asking Swiss Bruno Manser Fonds and OECD Watch to remove a document from their websites that is critical for an independent and transparent assessment of the NCP’s handling of this case. The NCP’s removal, on May 11, of its own July 2017 eight-page final statement and its replacement by an uninformative, one-page final statement deepens our concern about the NCP’s handling of the case. 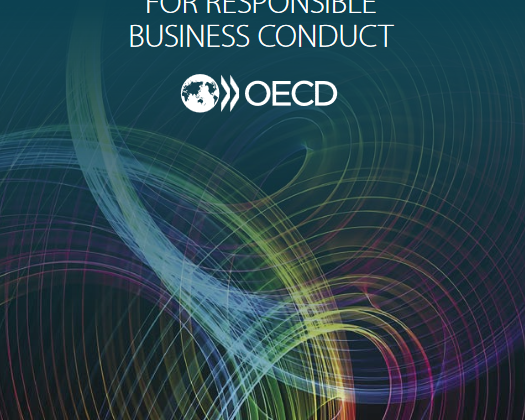 See OECD Guidelines for Multinational Enterprises, 2011. pp. 72-73 and 79, among other places where transparency is discussed as a critical principle. threatening and trying to silence not-for-profit organizations in the Netherlands, Switzerland and Canada through cease and desist letters. The 2018 final report of the UN Working Group on Business and Human Rights’ mission to Canada notes that the “lack of confidence of civil society in the National Contact Point was apparent.” The NCP’s handling of this case has completely eliminated civil society’s confidence in this office. It also strengthens the case for rigorous independence for Canada’s newly announced Canadian Ombudsperson for Responsible Enterprise (Ombudsperson). The Canadian NCP should consult the notifier and revise its second final statement to remove the biased and misleading allegation of only the notifier’s breach of confidentiality. Inclusion of the allegation against BMF, alone, is biased because the first final statement clearly stated that the company also had “involve[ed] a Member of Parliament during the confidential NCP assessment process.” Including the allegation against BMF is misleading, because it implies the alleged breach was the reason for the rejection decision. As we clarify above, the decision of March 2017 to reject the case was made before BMF sought public attention for the NCP’s unexplained reversal. Further, the first final statement of July 2017 never suggested (as it logically could not have) that confidentiality breaches were the reason for rejection of the case. Instead, that statement listed various actions by both parties as evidence that mediation would be unsuccessful. For sake of transparency, a new revised final statement should remove allegations of confidentiality breach, and explain the actual reason why the NCP reversed its decision, in March 2017, and decided to reject the case. The recommendation has been removed from the second final statement without explanation. 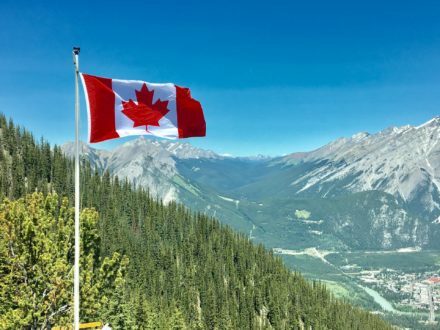 The Canadian NCP and Canadian Department of Justice should withdraw the “cease and desist” threat to OECD Watch, MiningWatch Canada and BMF, and commit not to threatening civil society in this way in the future. The Canadian government should create an independent, multi-stakeholder NCP Steering Board with both advisory and oversight roles, having capacity to review and reopen cases in which the NCP has failed to follow its own procedures correctly. This body will ensure that the Canadian NCP operates in an impartial and equitable manner in processing cases. For comparison, the NCP of the United Kingdom has such a steering body to help support the integrity of the UK NCP. We maintain that this case underscores the need for such a body. Canada’s National Contact Point – Canadian social partners for the OECD Guidelines for MNEs. representing both business and labour interests. Civil society organizations are also key users of the NCP mechanism, and the NCP would benefit from formalizing a partnership with civil society. 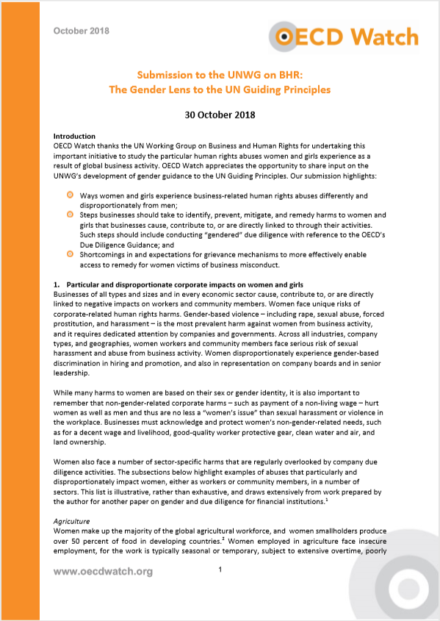 Report of the Working Group on the issue of human rights and transnational corporations and other business enterprises on its mission to Canada. April 23, 2018. MiningWatch Canada submission to the 2018 Peer Review of the Canadian NCP. January 23, 2018. OECD Watch submission to the 2018 Peer Review of the Canadian NCP. 29 January 2018. “Canada Is Back” But Still Far Behind: An Assessment of Canada’s National Contact Point for the OECD Guidelines for Multinational Enterprises. November 2016.